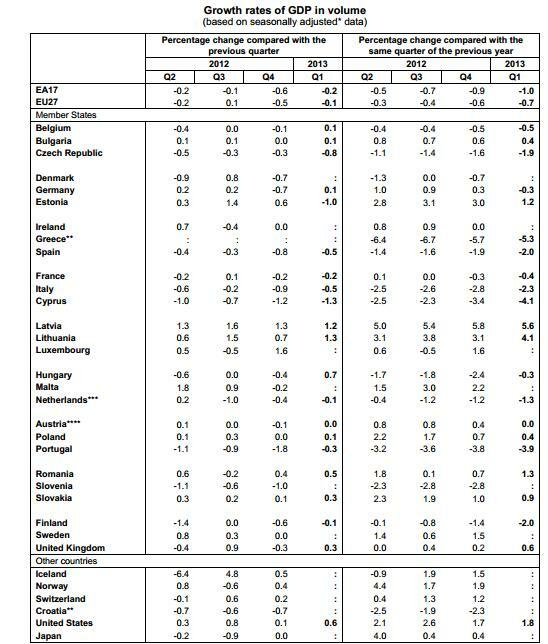 This morning, Ireland’s Central Statistics Office (CSO) has released its inflation figures for April 2013. The monthly headline Consumer Price Index (CPI) was flat in April 2013 compared to the previous month, and is still only up a modest 0.5% year-on-year. April’s results mirror those of Sept 2012-March 2013 and continue a subdued annual inflation trend seen in recent months compared with the 2%+ that pertained before January 2011. Housing has stopped being the biggest driver of annual inflation, mostly because mortgage costs have been declining – by 6.8% in the past year, as ECB rate cuts and greater scrutiny of variable mortgage interest rates take effect. Just a few months ago, mortgage interest was rising by 20% per annum, and as mortgage interest costs account for over 5% of the basket which measures inflation, the impact on inflation was substantial. 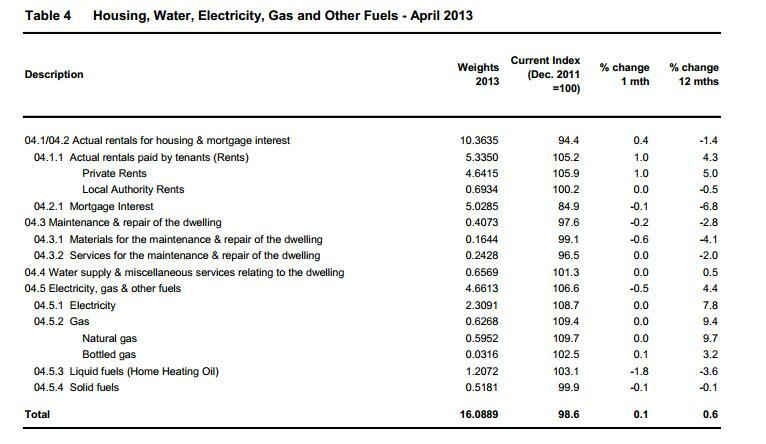 Energy costs in homes on the other hand, which account for over 5% of the total basket examined by the CSO, have risen by 4.4% in the past 12 months, mostly driven by the 9% price hikes at the ESB, and in October 2012 at Bord Gais. Elsewhere, private rents rose by a stonking 1.0% for the second month in a row – this after modest increases in February and January but bigger increases in previous months: 0.7% in December, 0.6% in November, 0.7% in October and 0.9% in September 2012. Over the past year, such rents are up by 5.0% according to the CSO – there is some small rounding in the figures above which show 5.4%. The results today are supported by the PRTB index launched yesterday which shows actual rents nationally up by 2% in the past year, and the Daft.ie asking rent index which suggests rents are up nearly 3%. There are no doubt regional and property-type variations, yesterday’s results from the PRTB suggested rents on apartments in Dublin were still declining but houses were increasing. It seems that in our financial crisis, the big correction in rent took place in 2009 with a 19% maximum decline, compared to a decline of just 1.4% for all of 2010. Since the start of 2011 there has been a 9.3% increase (mostly recorded in February and October 2011 and February and September/October/November 2012 and March/April 2013). The old media is today claiming that the new residential rent index from the Private Residential Tenancies Board provides for the first time an index of actual rents rather than the asking rents that Daft.ie tracks. That claim is rubbish, as the CSO incorporates private rents in its monthly inflation figures, and the source for their figures, are estate agents across the country providing actual rents. Apparently the PRTB index will support the findings of the CSO index and confirms residential rents are up modestly over the past year, 2% according to the old media which is in line with the 3.4% increase in the CSO index. The PRTB index is not yet online but it should be available here later today. It has been produced with the ESRI – no, don’t groan – and in the near future, not today, the CSO will provide a facility whereby you can look at types of property is all parts of the country, so if you want to see what a two-bedroom apartment costs in Athlone, you’ll be provided with averages and an index to indicate if prices are increasing or decreasing. “This is all great” I hear you say, so why are we being shortchanged? It recently emerged in the Dail that the PRTB had provided the Minister for Social Protection Joan Burton with a complete listing of ALL residential property rented in the country including address and rent amount. The listing did not contain the name of the landlord and tenant, and apparently in this way, according to Minister Burton, no data protection laws were broken. The Opposition tried to get hold of the database, but was told that the information had been provided by the PRTB to the Department of Social Protection pursuant to Section 146 of the Residential Tenancies Act 2004 and Section 261 of the Social Welfare Consolidation Act 2005. Minister Burton suggested to the Opposition that they might contact the PRTB themselves for the data, but because the Opposition is not the Minister or a Local Authority and therefore can’t rely on the 2004 Act, they’re not likely to be successful. So, perhaps today, we will get a small additional chink of light refracted through the dubious lens of the ESRI, but there is no data protection impediment to getting the full listing of addresses with rents, so that you would have true transparency. If you can see what a particular property sells for on the Property Price Register, why can’t you see its rent. Deputy Pearse Doherty: To ask the Minister for Social Protection further to Parliamentary Question No. 586 of 16 April, 2013, if she will make available the file of data received from the Private Residential Tenancies Board, data which she says does not give rise to data protection implications, but which presumably provides addresses, details of accommodation and rent costs. Minister for Social Protection, Joan Burton: As part of the review of rent limits, the Department has received information from the Private Residential Tenancies Board (PRTB) from its register of tenancies. This data exchange is provided for by legislation under Section 146 of the Residential Tenancies Act 2004 and Section 261 of the Social Welfare Consolidation Act 2005. The data snapshot provided contains details of registered tenancies and does not contain names of tenants or landlords. 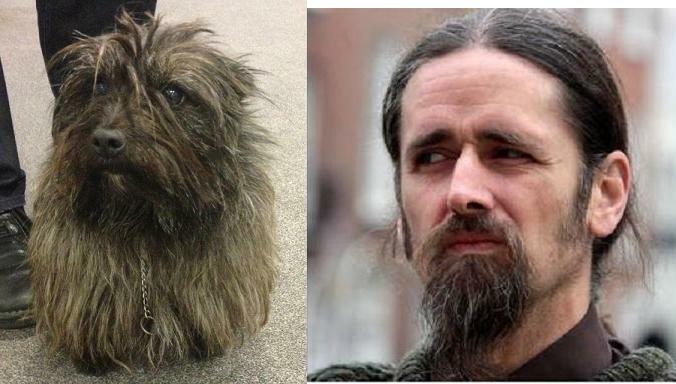 There are no data protection implications from the use of this information by this Department. However, the data provided to the Department remains the property of the PRTB. If the Deputy wishes to access such data he should contact the PRTB directly. Minister for Social Protection, Joan Burton: The purpose of the rent supplement scheme is to provide short-term support to eligible people living in private rented accommodation whose means are insufficient to meet their accommodation costs and who do not have accommodation available to them from any other source. The overall aim is to provide short term assistance, and not to act as an alternative to the other social housing schemes operated by the Exchequer. There are currently approximately 86,000 rent supplement recipients for which the Government has provided €403 million for 2013. As part of the review of rent limits, the Department received information from the Private Residential Tenancies Board (PRTB) from its register of tenancies. This data exchange is provided for by legislation under Section 146 of the Residential Tenancies Act 2004 and Section 261 of the Social Welfare Consolidation Act 2005. The data snapshot provided contains details of registered tenancies and does not contain names of tenants or landlords. 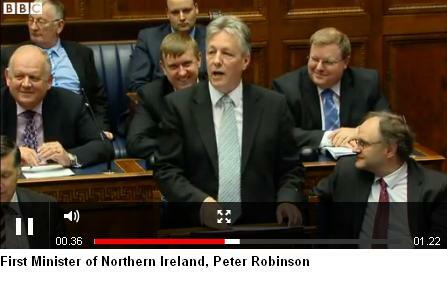 There are no data protection implications from the use of this information. Cash transactions: Even though the launch of the property price register at the end of September 2012, was six months ago, we still don’t have a monthly index covering all reported transactions. DAFT.ie has begun the work to produce hedonic indices based on all the transactions made available by the Property Services Regulatory Authority, transactions dating back to January 2010. Daft.ie now produces every three months an index based upon the Property Price Register, and as that Register gets more data, you can expect the Daft.ie to overtake the CSO’s own index. What’s surprising about the latest release? Apartments fell by 7% nationally and in Dublin, and that might reflect low volumes, but all categories in all areas declines. The March 2013 decline of 0.5% is less than the 1.5% decline in February 2013. Are prices still falling?After four months of consecutive declines, you would tend to say “yes” prices are still declining. 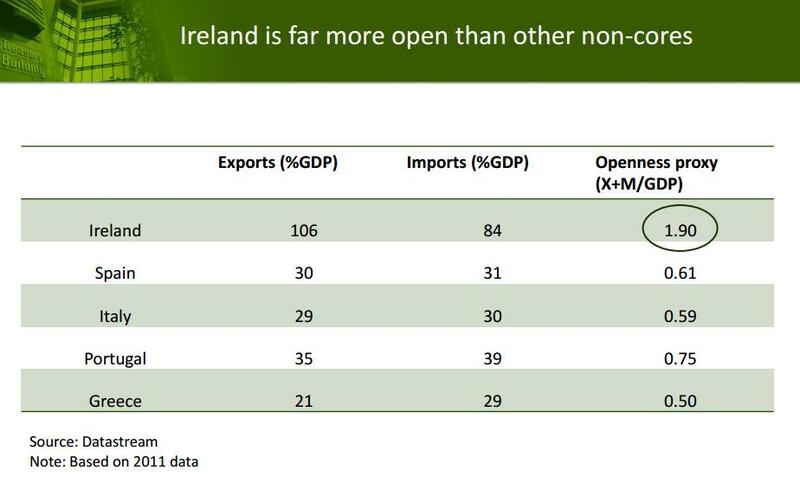 And the decline in Dublin of 0.8% was greater than the 0.3% outside Dublin. How far off the peak are we? Nationally 50.9% (52.0% in real terms as we have had inflation of just 2.4% between February 2007 and March 2013). Interestingly, as revealed here, Northern Ireland is some 56.3% from peak in nominal terms and 63.2% off peak in real terms. 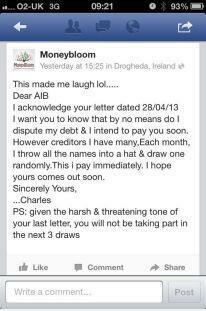 Are forbearance measures by mortgage lenders, a draconian bankruptcy regime and NAMA’s (in)actions distorting the market? Or are cash transactions which are not captured by the CSO index so significant today that if they were captured, the decline in the Republic would be even greater? How much further will prices drop? Indeed, will prices continue to drop at all? Who knows, I would say the general consensus is that prices will continue to drop. This is what I believe to be a comprehensive list of forecasts and projections for Irish residential property [house price projections in Ireland are contentious for obvious reasons and the following is understood to be a comprehensive list of projections but please drop me a line if you think there are any omissions – note January 2013 Fitch and S&P being inserted shortly]. What does this morning’s news mean for NAMA? The CSO index is used to calculate the NWL Index shown at the top of this page which aims to provide a composite reflection of price movements in NAMA’s key markets since 30th November 2009, the NAMA valuation date. 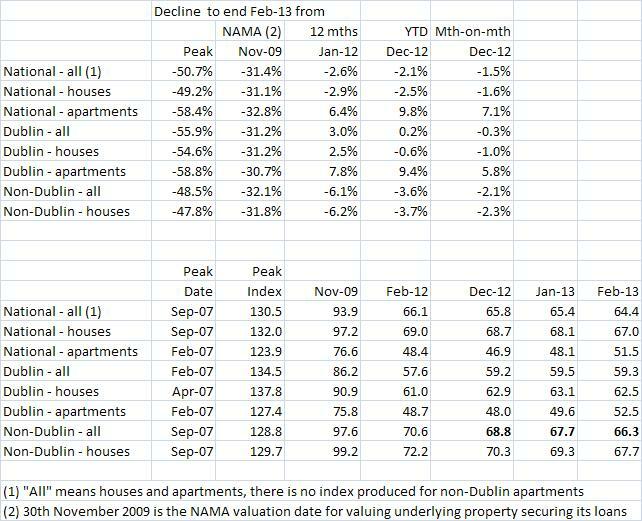 Residential prices in Ireland are now down 31.7% from November, 2009. The latest results from the CSO bring the index to 775 (29.0%) meaning that NAMA will need see a blended average increase of 29.0% in its various property markets to break even at a gross profit level. The CSO index is a monthly residential property price index calculated from mortgage-based transactions. The main other index is that produced by Daft.ie based on the Property Price Register. There are four other residential price surveys, based on advertised asking prices or agent valuations (see below, details here). 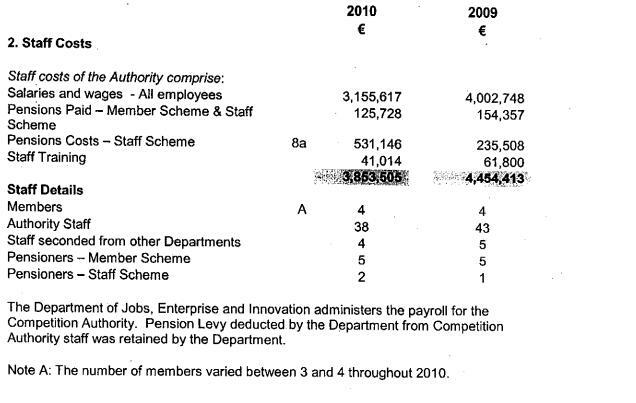 In addition Phil Hogan’s Department of the Environment, Community and Local Government produces an index based on mortgage transactions, six months after the period end to which the transactions relate, and which is not hedonically analysed – it is next to useless, and as some might say is a reflection of Minister Hogan, the Department will continue to produce these indices at a “marginal cost”. What’s surprising about the latest release? Prices nationally experienced their biggest monthly decline since February 2012. However apartments both nationally and in Dublin bucked the trend with 7.1% and 5.8% increases respectively. It seems the withdrawal of tax relief on mortgages for first time buyers at the end of December 2012 has reduced demand and prices, and although it will still take some months to form a meaningful assessment, the indications are that the withdrawal has generally led to price declines. Are prices still falling?After three months of consecutive declines with the declines nationally increasing, you would tend to say “yes” prices are still declining. However the decline in Dublin was 1% and this masked an increase in apartment prices of 5.8% offset by a decline in house prices of 1%. How far off the peak are we? Nationally 50.7.9% (51.6% in real terms as we have had inflation of just 1.9% between February 2007 and February 2013). Interestingly, as revealed here, Northern Ireland is some 56.3% from peak in nominal terms and 63.2% off peak in real terms. 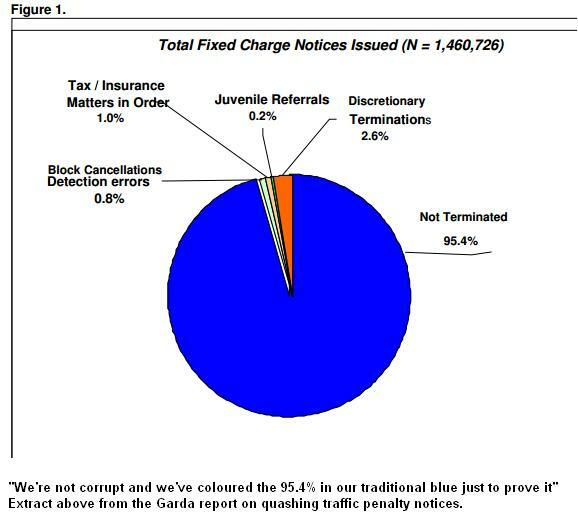 Are forbearance measures by mortgage lenders, a draconian bankruptcy regime and NAMA’s (in)actions distorting the market? Or are cash transactions which are not captured by the CSO index so significant today that if they were captured, the decline in the Republic would be even greater? What does this morning’s news mean for NAMA? The CSO index is used to calculate the NWL Index shown at the top of this page which aims to provide a composite reflection of price movements in NAMA’s key markets since 30th November 2009, the NAMA valuation date. 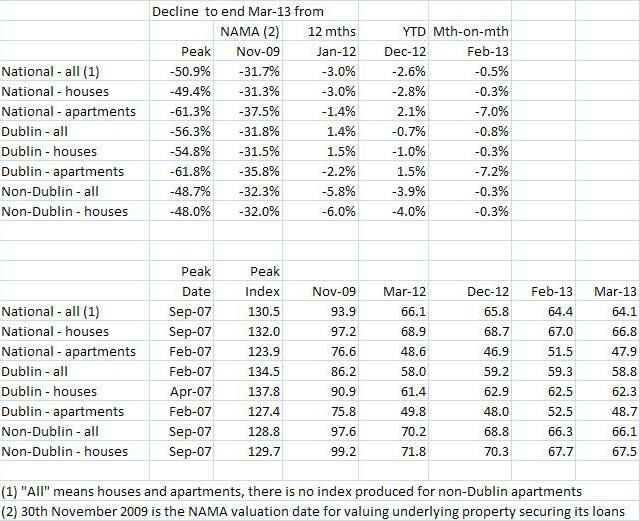 Residential prices in Ireland are now down 31.4% from November, 2009. The latest results from the CSO bring the index to 778 (28.5%) meaning that NAMA will need see a blended average increase of 28.5% in its various property markets to break even at a gross profit level.